At Diabetes and Endocrinology Associates of Stark County, Inc., Dr. Arvind Krishna diagnoses and treats the full spectrum of common and rare endocrine, hormone, and metabolic disorders. We also prioritize patient education and training. For example, while diabetes is very common, it is also quite a challenging condition to manage. That’s why we offer the most comprehensive, in-office diabetes education to our patients so that the newly diagnosed diabetic understands how to conduct the various self-care components of their regimen, along with its importance. This includes blood sugar testing, counting carbs, exercises, and more. Also, patients with any type of endocrine disorder understand the importance of weight loss to help manage their condition and control symptoms. Our physician-monitored weight loss program offers valuable support in this regard by focusing on maximizing fat loss while preserving muscle. Diabetes is a disease that affects how the body uses glucose, a sugar that is the body's primary fuel source. In a healthy person, a hormone called insulin helps glucose enter the body’s cells, where it is used for energy. People with diabetes do not produce insulin, do not produce enough insulin, or the insulin does not work as it should. As a result, glucose does not get into the body’s cells and builds up in the blood. Too much sugar in the blood can make you ill and result in medical complications. Diabetes is a challenging condition to manage, and there’s a lot to learn. That’s why we offer the most comprehensive diabetes education right here in our Canton office. From frequent blood sugar testing to counting carbohydrates, to getting just the right amount of exercise, it is important that the newly diagnosed diabetic understand the roles each segment of their treatment and management play. Dr. Krishna and our highly knowledgeable and capable team of certified nurse practitioners, certified diabetes educators, and insulin pump trainers will take the time to teach you everything you need to know to manage type 1 and type 2 diabetes. We can also arrange for outpatient diabetes education classes and dietician consultations at various area hospitals. The thyroid is a small gland, shaped like a butterfly, located in the lower front area of your neck. It secretes hormones, which secretion is controlled by the pituitary gland. Sometimes the thyroid gland malfunctions. It can be too active or not active enough, or it can have structural damage that causes problems. For hyperthyroidism, thyroid cancer, and some other thyroid conditions, Dr. Krishna may recommend a radioactive iodine uptake scan – a brief, safe, and simple test that is performed at the hospital. This nuclear medicine test provides useful information that helps further treatment planning. In addition, Dr. Krishna is credentialed to administer radioactive iodine therapy to treat thyroid cancer. He can also arrange for and administer Thyrogen® injections, which contain a form of human thyroid stimulating hormone (TSH) and are used for whole-body scans during cancer treatment follow-up. 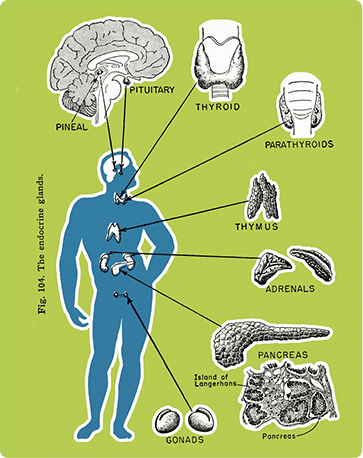 Most people have four pea-sized glands, called parathyroid glands, adjacent to the thyroid gland in the neck. Though their names sound very similar, the thyroid and parathyroid glands are completely different. The parathyroid glands make parathyroid hormone (PTH), which helps your body maintain the proper balance of calcium and phosphorous. Sometimes the parathyroid glands make too much or too little hormone. Adrenal glands are triangle-shaped glands located on top of the kidneys. They produce steroid hormones such as cortisol, aldosterone, and testosterone, as well as adrenaline, a hormone commonly released in response to stress. When these glands produce more or less hormones than your body needs, you can become ill.
Adrenal gland disorders are conditions that interfere with the normal functioning of the adrenal glands. They are characterized by adrenal insufficiencies, in which the adrenal glands do not produce enough steroids and other types of adrenal hormones. Your pituitary gland is a pea-sized gland at the base of your brain. The pituitary gland is the "master gland" because it is responsible for regulating many of the functions within the body. It makes hormones that affect growth, blood pressure, and the functions of other glands in the body. With pituitary disorders, you often have too much or too little of one of your hormones. Acromegaly – when the pituitary gland produces too much growth hormone in adulthood. At Diabetes and Endocrinology Associates of Stark County, Inc., we can arrange for and administer convenient, in-office Sandostatin® LAR Depot IM (octreotide) injections. Osteoporosis is a disease in which gradual calcium loss causes bones to become more fragile and more likely to break. It occurs most frequently in women after menopause, but it can also occur in men. Osteopenia refers to bone mineral density (BMD) that is lower than normal, but not low enough to be classified as osteoporosis. It is often a precursor to osteoporosis. At Diabetes and Endocrinology Associates of Stark County, Inc., we offer our patients a revolutionary, physician-monitored weight loss program that focuses on fat loss instead of muscle loss. This may be ideal for diabetic patients who wish to manage their condition with a “better control with fewer meds” approach. We perform a comprehensive endocrine evaluation to help identify possible causes for obesity. We also have experience with prescription of weight loss medications for appropriate patients. At Diabetes and Endocrinology Associates of Stark County, Inc., we offer a wide variety of insulin pens and pumps. Our experienced and compassionate team can expertly guide new users in the use of such devices – as well as answer any questions you may have when it comes to treating your diabetes or other endocrine disorder. If you have diabetes or another endocrine system disorder, and you’re looking for the most advanced care possible in Canton, Ohio, visit Diabetes and Endocrinology Associates of Stark County, Inc. Dr. Krishna provides a comprehensive range of on-site services and the most current treatments available. Call us at (330) 493-0013 or use our convenient appointment request form.